Mommy finished her March Knit Something of the Month project and now I get to wear it. 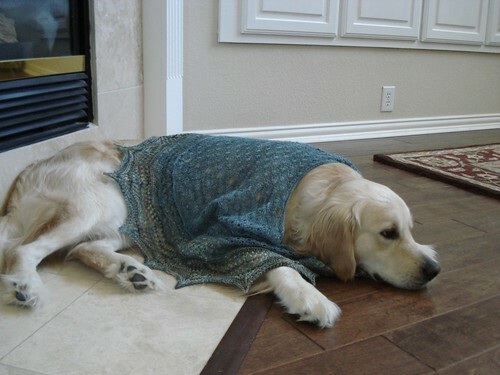 She knit the small size, but you can see that it is still a very nice size for a large Golden Retriever. She used Pagewood Farms Yukon yarn in Teal for the main color and Misty for the contrast color. 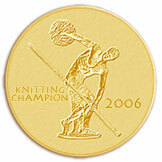 Now you can see the contrast color better, in the edging. You can also see the mosaic knitting a bit in this picture, but Mommy said to show you the detail picture of it so you can see it better. I'm not really in the detail very much so I'm not sure why anyone wants to see this, but here it is. 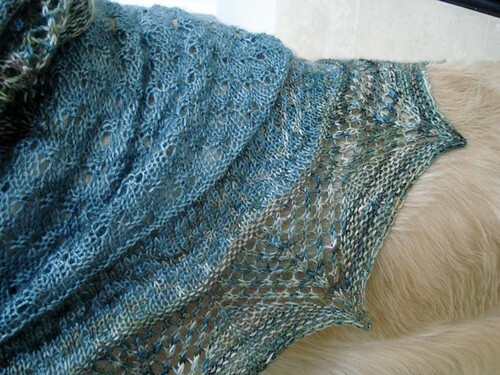 This shawl doesn't feel as lacy as some of the shawls I've gotten to wear. I think it will be warmer for Mommy when she wears it. That's pretty much all the details about it. I'm getting bored sitting here for all these pictures and there's a kitty to chase, so I hope you enjoyed seeing Mommy's latest knitting. I'm sure she'll be back tomorrow babbling about something or other! I don't know what more beautiful. 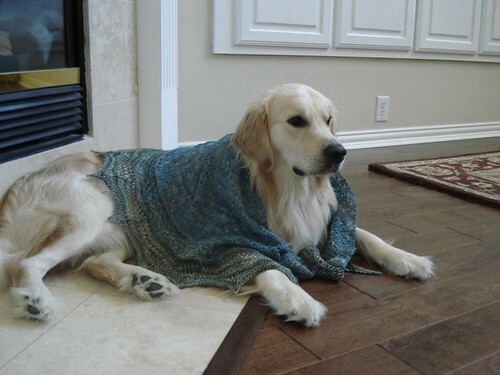 That lovely shawl or the breathtakingly beautiful model! The eyes are bright, the skin is clear, the blonde hair is so lovely and silky! That model should be nationally famous! Oh, wait! He IS! Way to go, Logan! 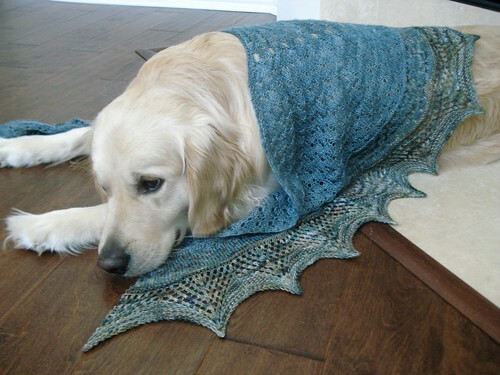 I agree with Connie- beautiful shawl and absolutely gorgeous model!